Urban chic in one of DC's hottest neighborhoods, the Sheldon features lovely one- and two-bedroom apartments with hardwood floors, high ceilings and private balconies. Originally constructed in 1918, the Sheldon apartment building was renovated and reopened 2000. 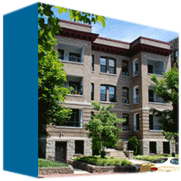 Situated on a quiet one-way, tree-lined stretch of T Street NW, the building is in the heart of the historically rich U Street commercial corridor and within walking distance of Metro's Red and Green line Metro stops. The quiet street that the Sheldon shares with a stretch of row houses is stands in contrast to the vibrancy of U Street. Bustling with activity, the U Street corridor is one of DC's hottest neighborhoods. U Street boasts an eclectic mix of boutiques, bars, cafes and restaurants. Just a few blocks from the Sheldon your nightlife options include reggae, worldbeat, jazz, and indie/alternative rock either performed live or spun by some of the East Coast's top DJs. High-style, dog-friendly, quiet, and located in one of DC's hottest neighborhoods, the Sheldon is a wonderful building to call home.